While the first legalisation time for cannabis in Canada occurs in Newfoundland one and a half hours earlier (NDT -2.5), the Ottawa chart will be the one that dictates the mandate of the nation. The date is October 17, 2018 at 0:00 Ottawa, Ontario. So what does this chart tell us about this change in legislation? The first thing we notice in this chart is the placement of Neptune. Neptune is the natural ruler of drugs and basically intoxicants. Neptune is in the ninth house of the law and it also rules the ninth house because Pisces on the cusp of the ninth house, pot becoming legal makes the chart apropos. You can see this the timing is reflected in the government’s date of legalisation. The ninth house is of foreigners or it could be tourists as young people might be drawn to coming here because of legalisation. Jupiter which can be about joviality and indulgences is in the fifth house of fun and pleasure but in the sign of taboos, Scorpio. This indicates how something that was once bad will now be considered fun and entertaining. The tenth house representing the government has Aries on the cusp. Mars the ruler is in the seventh house in Aquarius. The government is working with others to bring about freedoms and forward thinking. Uranus the ruler of Aquarius is in the tenth house suggesting they are looking for a utopian, forward-thinking path and also rebelling against their neighbours. The USA is opposed to our legislation but as we a free and independent nation we have taken the stance to move forward in the best interests of our nation. One of the best interests is shown by the Part of Fortune being in the tenth house. The fortune that will come from this is the taxation of something that had a black market industry. The source of income before was untouched but will now come in the hands of the government via taxation of the sale and of the legal employee’s salaries. The other savings that will come from this legislation will be the costs associated with courts and jail time for offenders. So this seems to be a win-win. The previous New Moon occurred in the fourth house in the nation represents a new outlook for the nation and for the people of the land. The Ascendant has Cancer and is ruled by the Moon in Capricorn in the sixth house. It is squaring the Sun which is the leader of the country. Obviously, legalisation is going to cause an issue for the labour force as there will be codes of conduct relating to impairment, defining driving under the influence and other such matters. I believe once the novelty wears off, it will be business as usual. The sixth house deals with health issues as well. There are many benefits to this drug that are beyond recreational use. Stress relief and pain relief and comfort are a couple of the benefits. The “high” component of TCH can be weeded out of the drug to produce Cannabidiol (CBD) which is the component used to help people dealing with arthritic pain and other chronic illness of the sort. 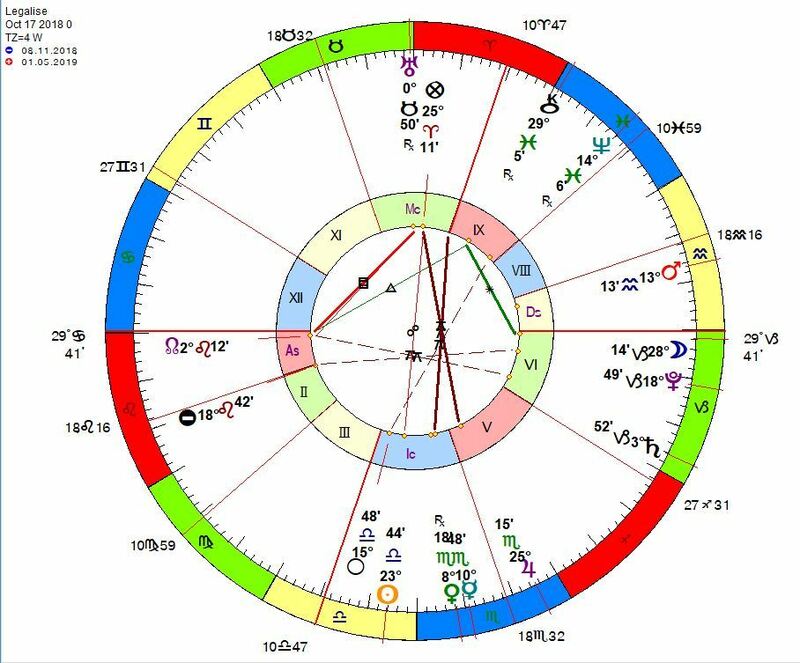 On a final note, the North Node of the Moon is in the first house of the people and square Uranus in the tenth house of the government suggests that this was a change that was revolutionary and was destined to come. As they say with alcohol, drink responsibly, I will say with pot, toke responsibly.